Description: There’s a new way to promote "The Good Stuff" in The Beach with Wasaga Beach TV. You might have spotted Wasaga Mike Jablonski, host of Wasaga Beach TV with his electric bike and a big red trailer driving up to the beach and setting up his tent while inviting people to introduce themselves and talk about their activities at the beach. Wasaga Beach TV is a local “You Tube” television channel with local programming and more shows in the works for Fall & Winter. Beach Booster Media Group is proud to be one of the sponsors of this great community venture. Joining Dianna for this week's BEACH CORNER is Wasaga Mike, who will share info on Wasaga Beach TV & tell us about upcoming programming. Please enjoy and SHARE this great local program from Beach BOOSTER Radio! There’s a new way to promote "The Good Stuff" in The Beach with Wasaga Beach TV. 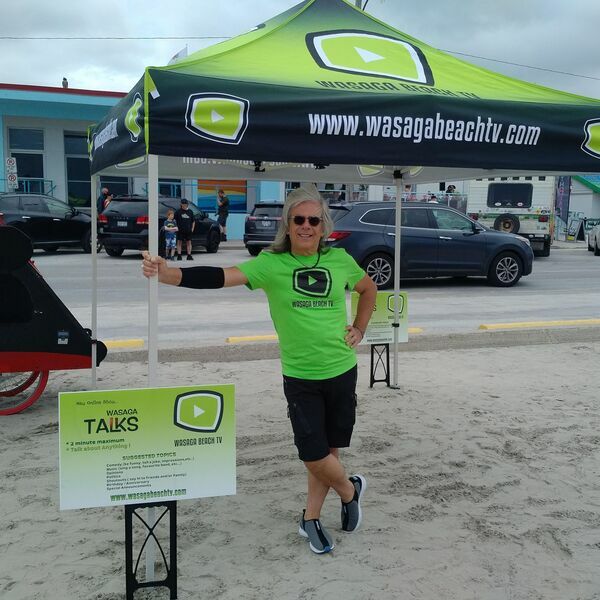 You might have spotted Wasaga Mike Jablonski, host of Wasaga Beach TV with his electric bike and a big red trailer driving up to the beach and setting up his tent while inviting people to introduce themselves and talk about their activities at the beach. Wasaga Beach TV is a local “You Tube” television channel with local programming and more shows in the works for Fall & Winter. Beach Booster Media Group is proud to be one of the sponsors of this great community venture. Joining Dianna for this week's BEACH CORNER is Wasaga Mike, who will share info on Wasaga Beach TV & tell us about upcoming programming. Please enjoy and SHARE this great local program from Beach BOOSTER Radio!